Last Tuesday we reported the sale of the 46.2m motor yacht Ares, and now Vesa Kaukonen at K&K Superyachts tells me that she has been renamed Auspicious and is available for charter. Delivered last year, Auspicious is the second yacht in Arno's acclaimed Leopard 46 series. Her sleek, stylish design provides a truly exhilarating cruising experience with a top speed of 33 knots. She can comfortably accommodate up to 12 guests in a master suite, two double suites and two twin suites with Pullmans. 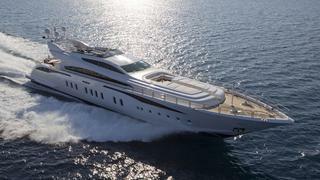 Her summer charter rates start at €180,000 per week.